Vizio GV42L display color mess puzzle - T-CON problem or main problem or what? This is just something that puzzled me and I decided to post it here. It's not the first nor the last time a TV displays such a problem, of course. we purchased a Vizio 42" LCD tv in October 2006. Model is GV42L and serial number is AHLEDGAG311057. Problem is that when we turned it on the other night the screen was pink and the people were swirly, like psychedelic. Sound is good. Any ideas? 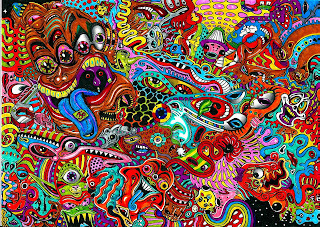 I've seen some scrambled images, of course, but this one is a piece of art! I'll be the first to admit art is not my strongest side, but you have to agree it's pretty darn close, eh? What bothers me is...is the TV actually broken and should it be fixed? Or should it be preserved as something with an original mind of its own? 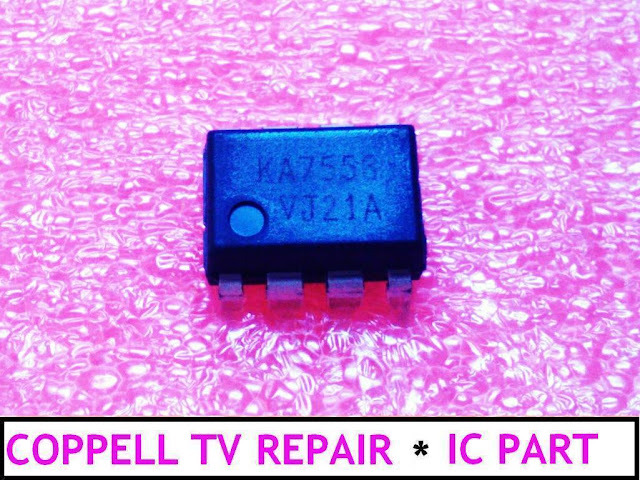 We recently needed KA7553 driver IC to repair a Samsung power board and we couldn't find one at a reasonable price and reasonably close so we ended up purchasing a few. In case you need one, you can get it at our web store. 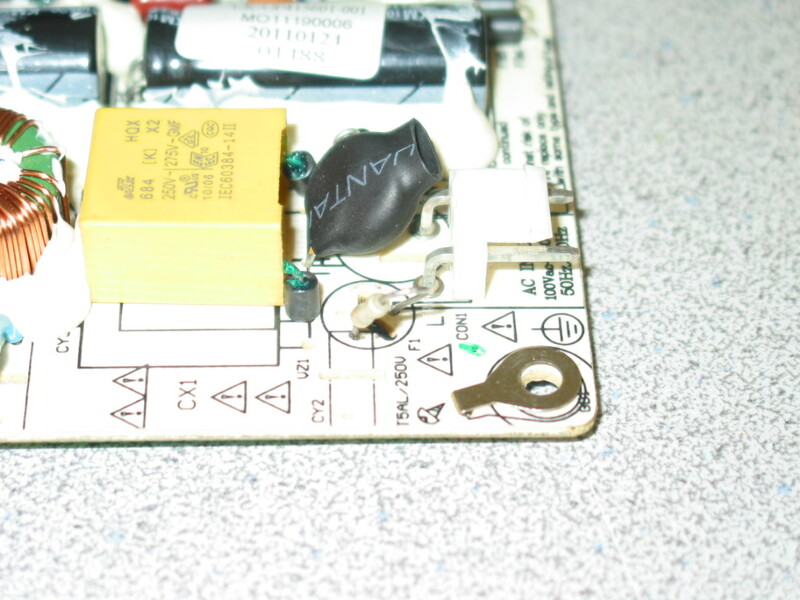 Synopsis: Recently we've been sent a power board from Olevia VLE-42FDVLDRB LED TV for repair. 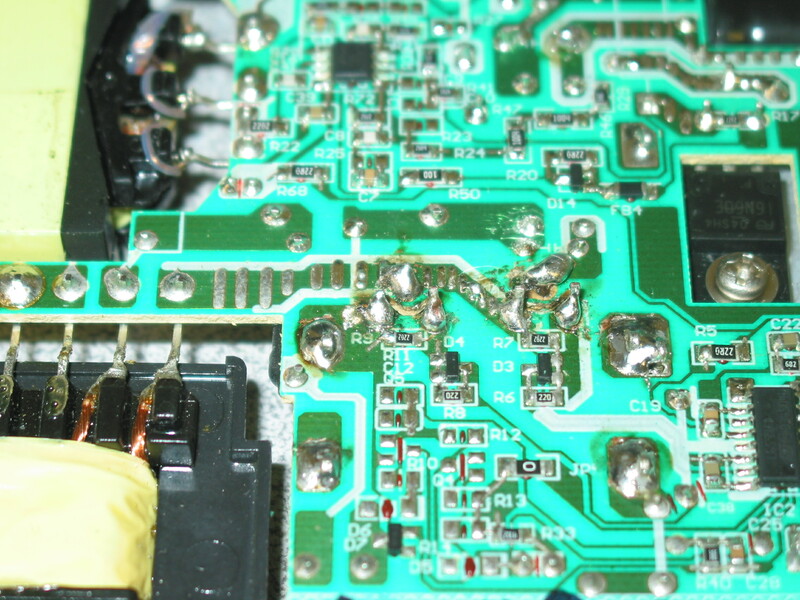 As many LED power supply modules it wasn't designed with repair options in mind. On top of that someone has messed up badly enough with it to prompt us writing this article. You can let us repair a board or you can get a replacement power board BL-OP415601-001 for your Olevia VLE-42FDVLDRB, but you can not expect us to fix your attempts of repairing it. I thought Olevia has gone out of business a few years ago, but apparently they've returned and are now back selling more cheap Chinese TVs. Well who am I to blame it, pretty much everyone does the same these days. So we received this power board from Olevia VLE-42FDVLDRB, which bottom side raises the promot feeling of a cheap floating and baking so familiar from other RCA branded TVs. Apparently the board has failed since the main AC fuse was replaced and the reason for the failure must have been either the primary rectifier or, more likely, the pair of driving FETs for the main transformer - Q1 an Q2 located under HS3. I say "apparently" because someone has already tried workng on those. The main fuse (5A/250V by spec) was replaced with a 7A one. The sole reason one should not do that is because it increases the chances of failing more components on the board should a problem occur, before the fuse blows. It's not the biggest sin in the business, but then again if you combine it with other signs of bad handling you can easily understand why we do not want to repair boards after someone else. 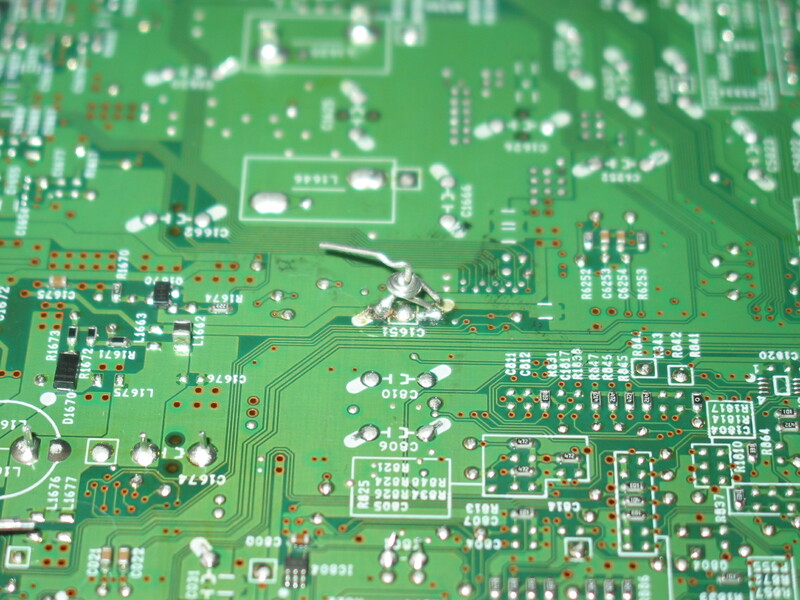 It is extremely easy to miss a cold solder or other uncommon problem on a board. It is hard enough to fix naturally occurring problems and if you add human-induced ones you easily get what insurance would call "a total loss" - a repair which would end up costing more than a replacement. 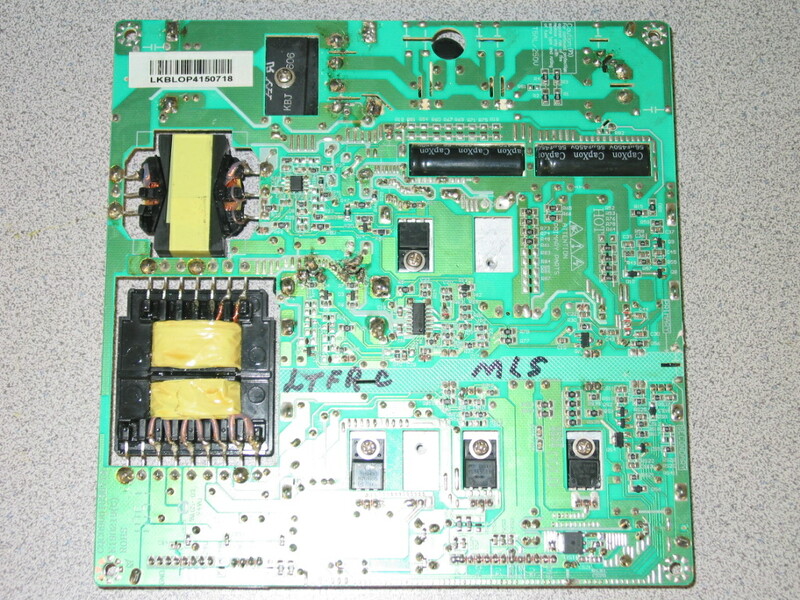 So in this particular case we pointed out the customer to a replacement power board BL-OP415601-001 for their Olevia VLE-42FDVLDRB. We kept the bad core - it won't be of help to them anyway - and if we have enough time we might take a shot at it. But I know from lots of experience it is not going to be fast and easy, let alone profitable. 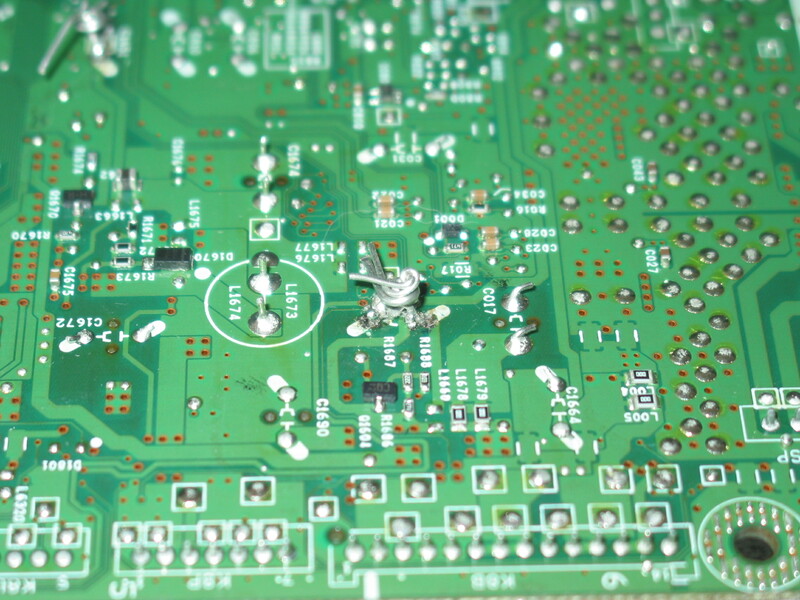 This is from a Sanyo J4FE main board which a customer sent for repair. 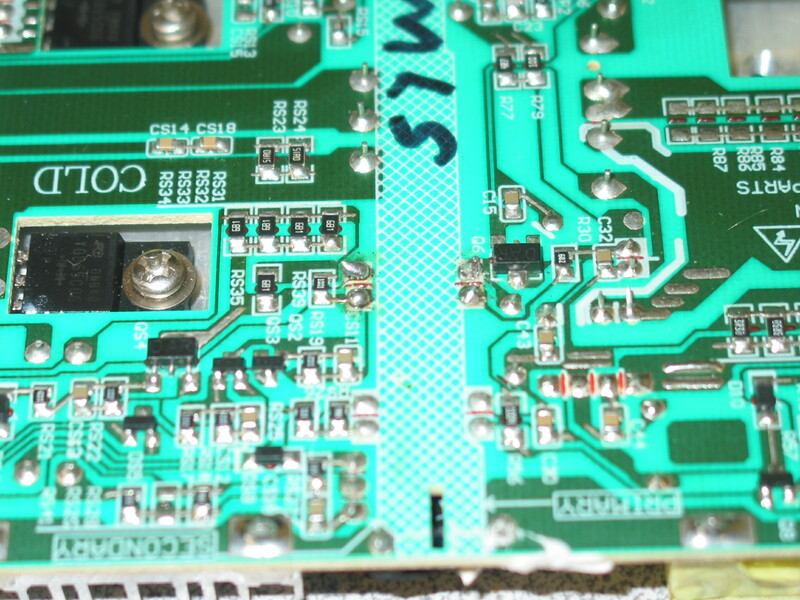 Here's the kick: we serviced , tested and returned the board without noticing those (there were two of them) capacitors with shorted and twisted legs. How could it have worked if it had capacitors' legs shorted and twisted like that? Excellent question! 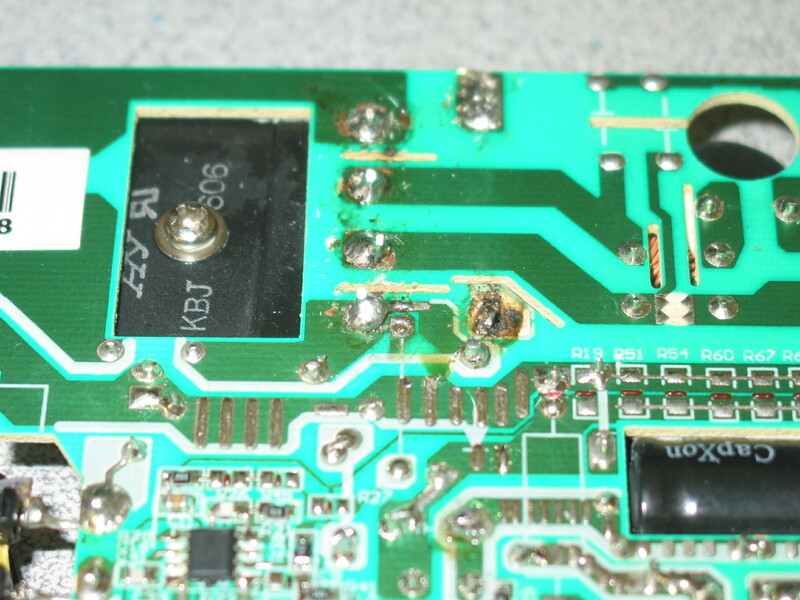 When removed from the board the original capacitors were not just desoldered. They were more like torn out of the board, removing the copper galvanization in the hole and around it. So when new capacitors were plugged in and wrapped like that for whatever strange reason, they actually were not making contact with the tracks that they were supposed to make contact with, at least not in our tests. We then received the board back for warranty service and noticed the problem. We told the customer we should not have done a repair in the first place and customer agreed to get all the money back in exchange for leaving us the board. Eventually we got it working properly (I hope) and we have it listed as an exchange main board for DP50749 P50749-00. But if we receive a board with similar traces of tampering (and we see them) we'll likely reject servicing it again.